Downey Daily Photos: Beautiful but deadly? I love angel trumpets and have been amazed as to how easy they are to grow and propagate. These flowers are so beautiful and exotic, I have maintained them in my yard ever since I was given a cutting from a friend. However, I was in for a little bit of a rude awakening when I looked them up to write about them for this post. Who knew they were toxic? Evidently every part of this plant contains dangerous levels of poison that can be fatal if ingested. 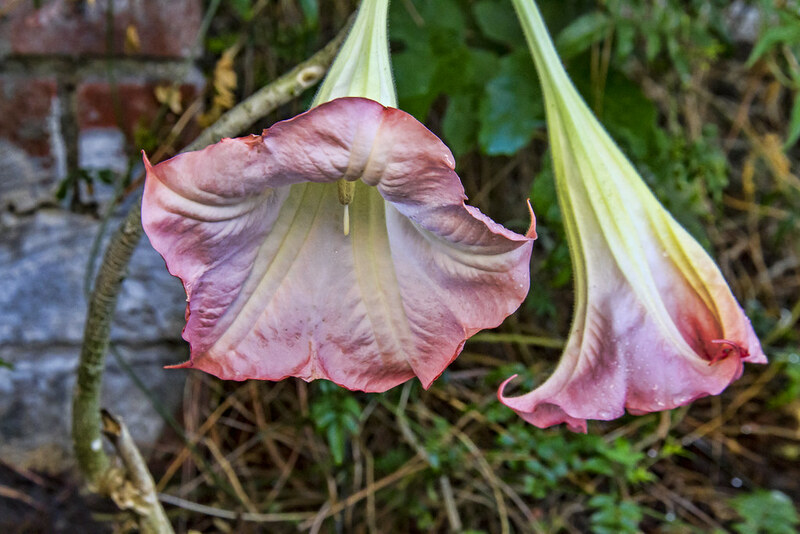 All parts of angel’s trumpets are considered poisonous and contain the alkaloids atropine, scopolamine, and hyoscyamine. Ingestion of the plants can cause disturbing hallucinations, paralysis, tachycardia, and memory loss and can be fatal. Various species were used both ritualistically and as an herbal medicine by indigenous peoples and their shamans, particularly in the northern Andes.